Big Diameter Corrugated Pipes are manufacturing by HDPE material and called as HDPE 100 corrugated pipes. It ıs manufacturing with big sizes in order to install for the big projects. Big – Larger diameter corrugated pipes have three options on connection types and using different pipe connection methods. The one from the corrugated pipes connection method is by muff itself. 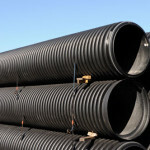 Big – Larger diameter corrugated pipes are can be connect to each other with muff and rubber Q- ring easly without any extra material. The second one of the connection method of Big – Larger diameter corrugated pipes is by coupler and rubber ring as one pieces for two pipes connection point. And the last one of the connection methof of Big – Larger diameter corrugated pipes is electro fusion welding method which is most preffered by the engineers to connect the larger diameter corrugated pipes. In electro fusion welding method two larger diameter corrugated pipes connection by with an electro fusion coupler and hoop. The welding type is very easy, fastly and more advantage for the projects underground. Big – Larger diameter corrugated pipes are manufacturing as SN 2, Sn4, SN6, SN 8 and SN 10 stifness values. Also can be manufacture as wished values. 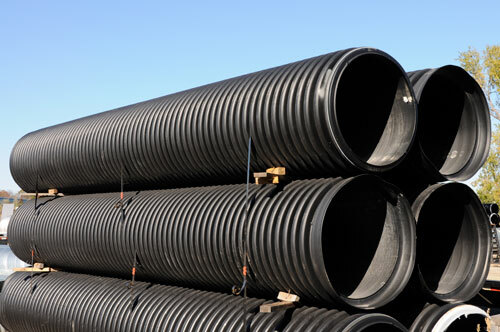 Big – Larger diameter HDPE corrugated pipes are manufacturing as 6 meters or 7 meters lenght as standard. To provide advantage from the transportation of Big – Larger HDPE diameter corrugated pipes we are manufacturing in 11,8 meters lenghs as per container standard sizes or manufacturing 13,5 meters lenght as per standard truck dimentions. Also for the neighbour countries we are manufacturing as 14 meters lenght with the legal permissions from the government to take best advantages on freight costs of the Big – Larger diameter HDPE corrugated pipes. -Big Diameter Corrugated Pipes – Steel Reinforced HDPE Corrugated Pipe have big advantages for the uses on the underground projects. -Corrugated Pipes Steel Reinforced HDPE Corrugated Pipe Stiffnes Ring provides strong resistant to outside affects. -HDPE Corrugated Pipes ease to transportation thanks to lightweight speciality. -Big Diameter Corrugated Pipes Steel Reinforced HDPE Corrugated Pipe- are can make welding by electro fusion coupler method with easly. -Big Diameter HDPE Corrugated Pipes can be install in the terrain area fastly and easy methods. -Big Diameter Corrugated Pipes – Steel Reinforced HDPE Corrugated Pipes are can produce in desired lenght to creat lower cost on transportation of the pipes. -Big Diameter Corrugated Pipes can produce according to EN 13476 standard. -Big Diameter HDPE Corrugated Pipes – Steel Reinforced HDPE Corrugated Pipes have easy and fastly welding method with electrofusion coupler. – Steel Reinforced HDPE Corrugated Pipe manuactured according to ISO EN 13476 standandard. -Big Diameter HDPE Corrugated Pipes – Steel Reinforced HDPE Corrugated Pipes also manufacturing as with muff to use with rubber ring and withour welding. Due to this way of connection there is no need to coupler to connect of Big Diameter HDPE Corrugated Pipes with easy and provides advantages on rubber ring and advantage for time.